‘Tis fabulous Friday again! Which means I can brag about my most excellent golf game before introducing my equally excellent guest. Oh, come on, I know you want to hear how I actually managed to play to my handicap for the first time in months, and how I would have scored even better had I not had those two duffed shots on the 17th. The question now is, can I do it again? Knowing the Hein prowess at golf, probably not. Never mind, I’ll always have Friday Feast to cheer me up, and I’m feeling very cheery indeed about today’s guest. If you haven’t read contemporary romance and romantic suspense author Elise K. Ackers then you need to correct the situation fast. This girl is talented. Like really talented. Elise’s stories vibrate with tension and emotion, featuring vivid characters that draw you into their lives and sweep you along on a heart-warming, drama-packed ride. Yes, I ‘m a complete fan girl and I’m not afraid to say it! Elise has just released the third book in her cracking Homeland series, Ask Me For Tomorrow. Take a look. Three years after losing his wife, Dean Foster feels like he’s living in a daze. When he finds himself attracted to his new employee, it comes as quite a shock. Single mum, Alice Jaye, is struggling to make ends meet. She’s too tired to flirt with her gorgeous new boss and firmly maintains a professional distance. But when their children bring them into close contact, keeping their relationship strictly business isn’t easy. As Alice and her son spend more time with his family, Dean’s heart begins to open once more. But can he risk starting all over again? This eagerly anticipated final book of the Homeland series is a tender, heartwarming story about letting go of the past and giving love a second chance. Eagerly anticipated indeed. And you can have your own copy right now. Buy direct from Destiny Romance or try Kobo, JB Hi-Fi, BigW ebooks, Google Play, iTunes or Amazon for Kindle. If ebooks aren’t your thing, keep your eye out for the paperback collection of all three Homeland books, coming February 2013. And now please give a big cheer for Elise! I’m delighted to be a guest on Cathryn’s Friday Feast, and admittedly, a little worried. If even one person makes this recipe, that’s a lot of responsibility on me. So allow me to preface the following with a warning: my cooking skills leave a lot to be desired. I can make five dinner dishes really well, five other dinner dishes moderately well, and the rest are out of my league. I’m a dessert girl. For eating, for making – I’m the person who thrusts her hand in the air to volunteer to bake for, well, any reason at all. Yet here I am, offering you a dinner dish because I wanted to challenge myself. But before you run away, the below recipe is for one of the better dinner dishes. One I’ve cooked for many, many people who are all still alive, and who remember the evening fondly (unless they’ve all agreed to never mention the meal, kind of like Bridget Jones’s blue soup incident). My mum walked me through this recipe before I moved out of home, and I’ve since adjusted it to be infinitely sweeter. You may find iterations of it on the web or in a cookbook – I’m not sure where my mum first learned it, but she successfully sent me out into the world with a few dishes in my repertoire. I was a very reluctant student, so hats off to her. 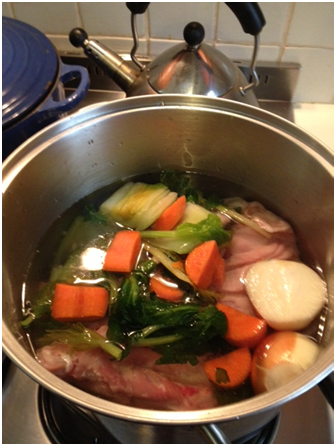 I have since learned, I think… two more dinner recipes on my own. Yet I’ll turn up with a new kind of cake, slice or biscuit almost every fortnight. So without further ado, I’d like to share my favourite chicken dish. It’s on the sweet side and can be garnished with any number of things. I’m quite minimalist about extras due to personal preference, so feel free to add colour, texture and taste where you see fit. And indemnify me from all outcomes! Mushrooms, onions, chicken stock, beans, etc all optional. Let your tastebuds guide you! Cut chicken into finger-width strips. Cook noodles as directed on packet. Simultaneously heat oil in a large frying pan and cook the chicken until golden brown. Remove from heat and set aside. In a bowl, mix mustard, honey, garlic and cream. 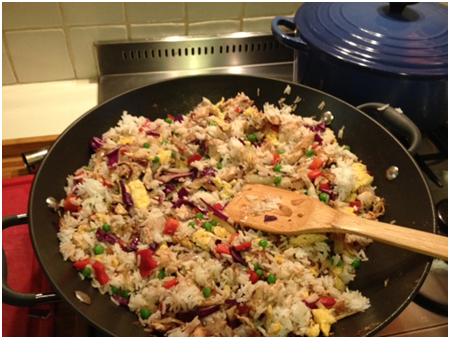 Put frying pan with chicken over low-medium heat, stir in sauce and heat through. Strain noodles, arrange on plates and load chicken and sauce on top. This is an almost colourless dish if you don’t add mushrooms, beans, etc, but having never added more flair than a sprig of parsley, I can’t make suggestions on this front. This is very tasty, it reheats really well, I’ve lost count of how many times I’ve made it and I’m confident someone in your house will like it. If Cathryn invites me back, I promise next time to share one of my baking recipes. They’re all terrible for your teeth and waistline, which of course, means they’re divine. Thanks for having me Cathryn, I’ve worked up my appetite now! So have I, Elise! 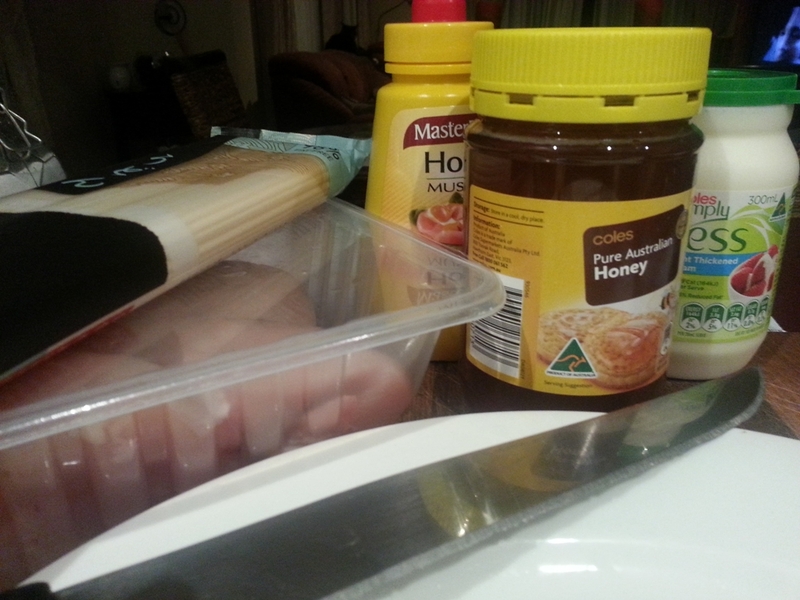 Mmm, honey mustard chicken. Now that’s a dish to make your mouth water, and perfect to tempt the tummies of any fussy eaters out there, I’m sure. Now, clever Feasters, do you have a fall-back recipe? One you know can’t fail you – that you’re perhaps a little known for? So what’s your crowd-pleaser? Share and everyone will pounce on you for the recipe, or think you’re awesome, or both. There is kudos in commenting! If you’d like to learn more about Elise and her amazing books, please visit her website. You can also connect via Twitter, Google + and Facebook. This entry was posted in Friday Feast and tagged Ask Me For Tomorrow, Ask Me For Tomorrow by Elise K. Ackers, Australian romance authors, Australian Writers, BigW ebooks, Cathryn Hein, Chicken recipes, Cooking, Creamy honey mustard chicken, crowd-pleaser recipes, Destiny Romance, ebooks, Elise Ackers, Elise Ackers Homeland Series, Elise K. Ackers, Elise K. Ackers Homeland series, Food, Friday Feast, Google Play, Homeland Books, Honey Mustard Chicken, iTunes, JB Hi-Fi, Kindle, Kobo, never-fail recipes, promo, Recipes on October 25, 2013 by cathrynhein. A happy bouncy Friday to you all! I hope you’re all revved up for a fantastic weekend. I know I am. It’s AFL Footy Finals time and my beloved Sydney Swans are out to defend their premiership crown, plus I have one of my favourite Aussie authors visiting Friday Feast. Too much excitement!! Multi-award winning author Anna Campbell writes luscious Regency period historicals overflowing with passion and emotion. They’re simply brilliant reads and I’m a huge fan-girl who gets more than a little bit giggly in Anna’s presence. Thanks to winning ARRA’s Favourite Australian Romance Author Award four years in a row, it’s fair to say she’s the reigning queen. A girl’s bound to get a bit silly! You want this, oh yes you do! And you can score your own rake with just a few easy clicks. Try most excellent Aussie bookseller Booktopia, otherwise Amazon or Bookdepository. For the ebook, try Kobo, Amazon (Kindle), JB Hi-Fi, Google Play, iTunes or your favourite retailer. And now I present the Romance Queen. Take it away, Anna! Hi Cathryn! Thank you so much for having me as your guest today on Friday Feast. You know I love being here, although I always feel like I emerge five kilos heavier after I’ve read your guests’ posts! Yum, yum, yum. Followed by nom, nom, nom. Oh, dear, I’m starting to sound like an Internet Cat! I promise no cheeseburgers were harmed in the making of this post. One of the fun things about visiting this blog (apart from hanging out with the very groovy Cathryn) is talking about scenes in my latest release that involve food. Last time I was here, I discussed yummy American wedding cakes. And the time before that, I talked about a scene in SEVEN NIGHTS IN A ROGUE’S BED involving seduction by baklava. By the way, if anyone wants to try this out on me for real, I’m game. I LOVE baklava! In A RAKE’S MIDNIGHT KISS, my latest release, more meal scenes are more prevalent than usual, partly because my rascally hero Sir Richard Harmsworth has infiltrated himself into the heroine’s home under a false identity. There are quite a few prickly conversations over the dinner table as Genevieve strives to dampen his seductive wiles. Needless to say, she doesn’t get far, but watching heroines try and depress our heroes’ impudence is always fun, isn’t it? Probably the most enjoyable meal for my hero and heroine takes place on a punt in Oxford. Richard has lured Genevieve into floating away to a secluded spot under a willow where sensual pleasures are rife. Including lunch! These Regency rakes know how to picnic in style. Fine gilded china. Crystal glasses. Linen napkins. Silk-covered cushions. Vintage champagne – allowing me to employ that romance staple, the heroine wrinkling her nose at her first taste. It’s a scene that pops up often in a romance. I think it’s a show don’t tell moment to demonstrate that the hero intends to sweep our heroine away into a world of new and glorious experiences. Like all good Regency picnics, the one in A RAKE’S MIDNIGHT KISS involves roast chicken. So I thought today, I’d share a VERY complicated recipe for chicken. Cover the bottom of a baking dish with oil of choice. Place in conventional oven at 180/200 degrees Celsius. Heat for 30/45 minutes. 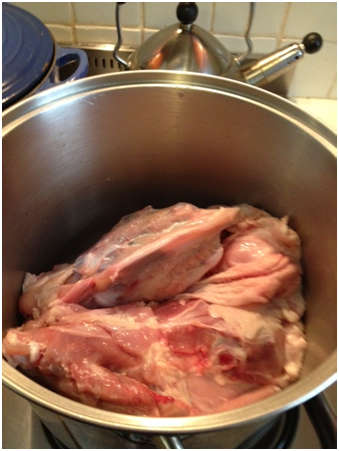 Take fresh or defrosted chicken and remove fat from the cavity. Rinse out the cavity. Wrap in tea towel to absorb extra moisture. Don’t refrigerate at this point. Pour large glass of wine and sit down somewhere comfy. Drink at own pace. Refilling as needed. If you are the heroine of a romance novel and the wine is a sparkling variety, wrinkle your nose, giggle winningly and say, ‘Oh!’ to the bubbles. Await kisses. When oil is sizzling hot (and preferably before you’ve had TOO much wine), place chicken in baking dish, breast down. Move around a bit to seal and to stop skin sticking to the pan. Baste. Return baking dish to the oven for 45 minutes. Stagger to oven. Turn chicken over and baste. Return to oven. If it’s a large chicken, leave it another 40/45 minutes. For a smaller chicken, around 30 minutes, but check regularly after 20 minutes, basting each time. Remove chicken. Let it sit for 15 minutes. Carve and eat. Open a new bottle of wine if old one is exhausted. I hope one day you’ll all try this complicated but rewarding recipe. I’ve made it several times myself to great headaches, um, success. So let’s talk picnics. What’s your ideal picnic location? Picnic menu? Picnic companion? Or don’t you like picnics at all and you’d rather do you nose wrinkling indoors? I’ve got a print copy of A RAKE’S MIDNIGHT KISS (with de rigueur champagne scene and roast chicken) for one commenter today. Giveaway is international! 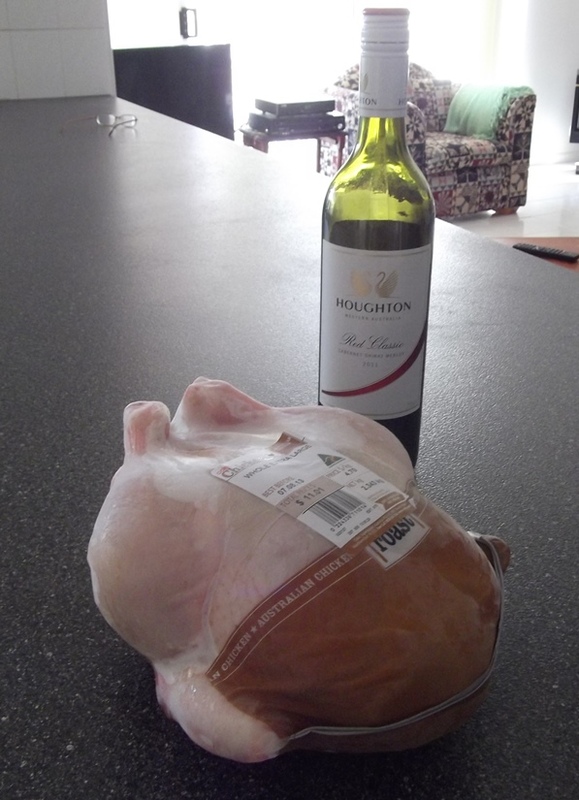 Roast chicken and wine…ooh, Anna, you’ve captured my heart! I can so, so relate to this kind of cooking. Happens rather regularly here on Friday nights thanks to Friday Feast inspiration. Now, my most gorgeous Feasters, you heard Anna. A print copy of A Rake’s Midnight Kiss awaits one lucky commenter. So get those typing fingers ready and share your picnic love (or unlove). Me, I adore a good picnic, even good old Aussie ones with ants and flies and other critters. My darling beloved used to treat me to rainy day picnics, where we’d lay out a rug on the lounge room floor, crack a bottle of excellent white wine, have a bucket of prawns at the ready and opera (yes, OPERA – we’re classy folk here at Chez Hein) on the telly. Prawns, a good white, Turandot, and a lovely time can be had. As long as my darling Sydney Swans aren’t playing at the time, of course! Giveaway closes midnight Tuesday AEST, 10th September 2013. Open internationally. Rah! If you’d like to learn more about Anna and her wonderful books, please visit her website. You can also connect via Facebook and Twitter. This giveaway has now closed. Congratulations to Paula who won herself a copy of Anna’s new release A Rake’s Midnight Kiss. Thanks to everyone who took part. Hope you had as much fun as Anna and I did. This entry was posted in Friday Feast and tagged A Rake's Midnight Kiss, Anna Campbell, Austral, Australian Authors, Australian romance authors, Australian Romance Reader Awards, Australian Writers, book giveaway, Bookdepository, Booktopia, Cathryn Hein, chicken and wine, Chicken recipes, Cooking, ebooks, Food, Friday Feast, giveaways, Google Play, iTunes, JB Hi-Fi, Kindle, Kobo, Picnic food, Picnics, promo, Recipes, Roast Chicken, Seven Nights In A Rogue's Bed, Sydney Swans on September 6, 2013 by cathrynhein.